Posted on June 22, 2009, 3:06 pm, by Saahir. New to the sometimes confusing and seemingly arcane world of making search engine friendly web sites? A new book offers a systematic, common-sense approach to the art and science of SEO. 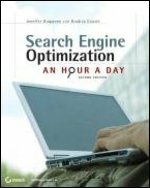 Search Engine Optimization: An Hour a Day by Jennifer Grappone and Gradiva Couzin is written for anyone who has a web site and has yet to embark on the time-consuming process of optimizing the site for search engines. Both authors are experienced SEOs, and the book reflects the systematic approach they’ve developed whenever working with a new client. Refreshingly, this approach focuses not only on technical tactics, but also on the reasons why SEO is important beyond just achieving high rankings in search engine results-things like business goals, creating appealing marketing messages and designing human-usable web sites. The book also avoids SEO techniques du jour, the kinds of tactics that are hotly debated in forums and that may or may not have any effect on your overall success.